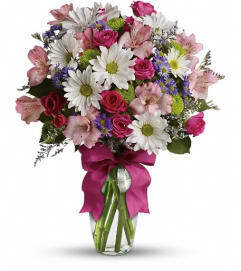 Whichever season of the year, this charming bouquet is like a breath of spring. 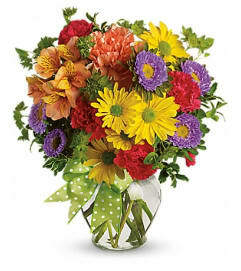 A gorgeous multicolored bouquet in a yellow vase tied with a yellow ribbon - couldn't be springier! The cheerful bouquet includes yellow alstroemeria, purple daisy spray chrysanthemums, hot pink spray roses, miniature peach carnations, white waxflower and purple Matsumoto asters accented with fresh greenery. 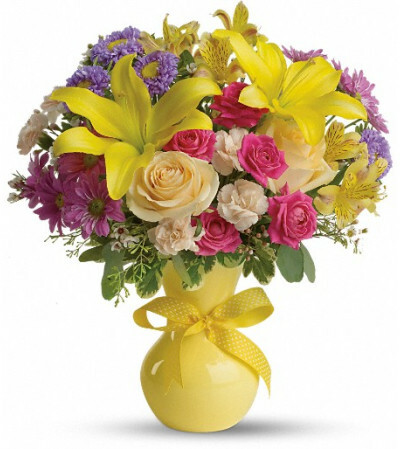 Delivered in a bright yellow plastic vase tied with a yellow ribbon with white polka dots. Recipients loved the arrangement! Great job! Prompt delivery... recipients loved the arrangement! Ordered online and delivered the same day! Great communication from this business to discuss the order with me personally.I will use this florist again in the future. Maine Street Florist & Gifts is a Lovingly Florist in Buxton. Buying local matters. Discover how Lovingly supports local florists. Copyrighted images herein are used with permission by Maine Street Florist & Gifts.